These Farm Heroes level 218 cheats and tips will help you beat level 218 of Farm Heroes. 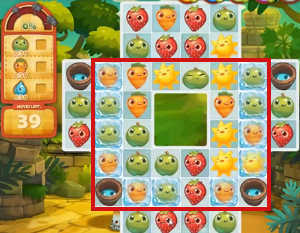 The objective of Farm Heroes level 218 is to collect 50 droplets, 50 apples, and 50 carrots in 40 moves. Before you can begin to make water droplets with the buckets on this level, you must break through the ice keeping them isolated in their corners. Break the ice by matching the cropsies inside. Remember that a match will not remove the frozen cropsie; it must be matched again to remove it from the puzzle (and into your growth meter). Only when all the ice surrounding a bucket is broken will the buckets begin to scatter droplets across the board that can be matched. Once you have exposed the rain buckets, make matches adjacent to them to fill them with rain. No raindrops will enter the board otherwise, so this is vital to your success on this level. Making matches of 4 that touch two rain buckets at once is a great way to save moves so you can potentially enter Hero Mode at the end of the level. Look for these types of matches at the start of every new turn. If you can, try to make your adjacent matches consist of either carrots or apples. 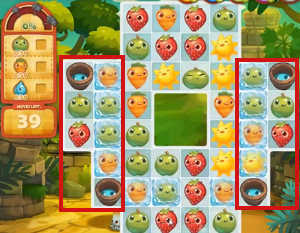 Being as the water droplets take the place of random cropsies, it is better to clear the board of as many essential cropsies as you can beforehand so that you aren’t struggling in the end with a lack of a certain cropsie you need. If you don’t have many water droplets close enough to make a good match, you should make more matches adjacent to other water buckets. This is a better alternative than wasting moves trying to shift the board so that the droplets fall closer to one another. Again, be on the lookout for matches of 4, but corner matches of 5 can also be of great use by unleashing a flurry of bonuses that will power up lots of cropsies. 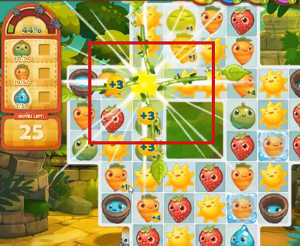 For maximum effect, make 4 or 5-cropsie matches low in the puzzle to trigger cascades. This may help you create more rain if your buckets are dry. Also, any cropsies that are matches with bonus points will yield more in your growth meter and towards your objective. Collecting 50 of each cropsie in 40 moves wouldn’t usually be too difficult, but this level is made much harder by the layout. By the time you have the single goal of collecting cropsies for your objective, you won’t have to many moves left. This is why making matches with bonus points are imperative.